There is a feeling about this production that all concerned have absorbed their Joyce in depth. The flavour, feeling and texture of the stories on which the show is based – The Boarding House, Eveline and Clay – are there securely, from the first minute to the very last. Two actors, Katie O’Kelly and Madi O’Carroll, bound onto the stage in their less than crisp, frilled bloomers and petticoats. They position a few items of vintage luggage which, together with just a few candles, comprise the set. 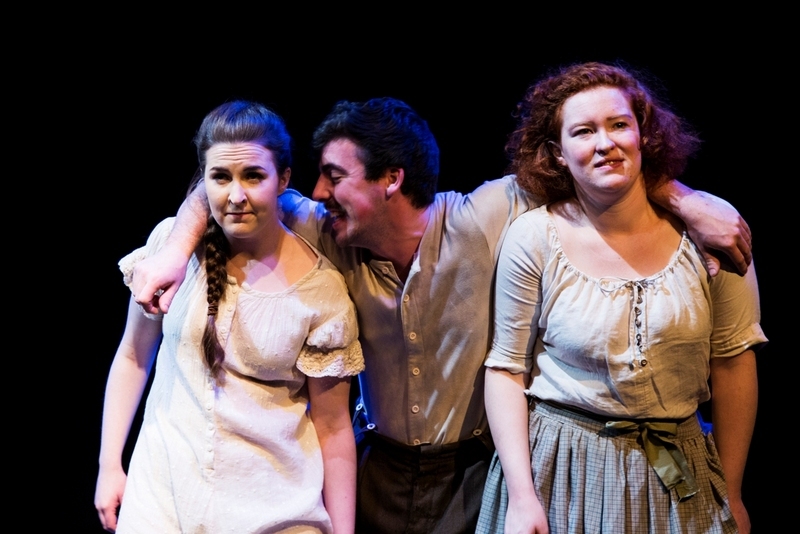 The third actor, Gordon Quigley, springs out of a heavy trunk in his sensible vest and long johns, to join them in the telling of the three Dubliners tales. Each actor plays several parts, each well delineated, and the strong ensemble playing is one of the show’s many strengths. The style is mainly ‘period’ but there are well-judged contemporary touches such as introducing play titles with mini-blackboards, the players suddenly syncing a line or phrase. 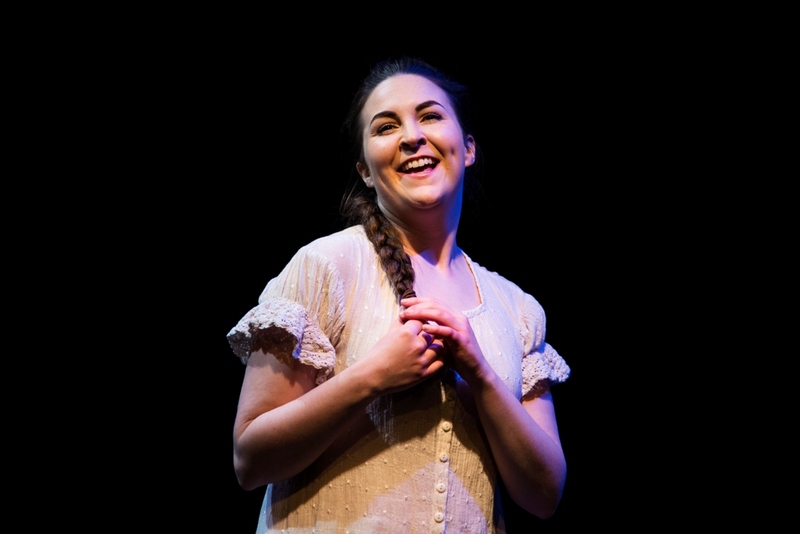 O’Kelly’s touching performance in Eveline catches her character’s brittleness and self-doubt as she stands on the North Wall, refusing to leave home at the last minute. Whether due to a promise made to her mother, the abuse by her father, her own natural timidity or maybe a not unfounded wariness of Frank is unclear from her reaction. The ambivalence of the original story is beautifully captured in O’Kelly’s performance, leaving us with a sense of a life unlived, a missed opportunity to escape the smallness of her Dublin existence. Her Polly, in The Boarding House, is a delight – a scheming, coquettish, pretend-prude who is in fact a sensual woman who will trade her reputation for a man of her own, a way out from under her mother’s roof. She doubles impressively as her own brother, Jack, belligerently defending his sister’s doubtful virtue. Similarly, her Maria in Clay is beautifully captured, ending in flustered confusion when she makes a mistake in singing I Dreamt in Marble Halls, perhaps deliberately avoiding the second verse (which signals romance and physical love). She had become “accustomed to the life in the laundry”, a spinster who had wasted a lot of her life on others and is, in the stories and in this production, an older, similarly unfulfilled mirrored version of Eveline, underlined by the repetition of Balfe’s song in both stories. O’Quigley plays a number of male characters and the occasional female, if the need arises. He stretches his versatility even further by creating the role of a straw armchair – surely a first! His Frank in Eveline is raffish, attractive and decent but with a faint whiff of sulphur, capable of tenderness and romance, in contrast to the bullying males that Eveline has known, in her home and at work. He doubles as her father figure: economical acting, done with simplicity and directed with perception. As Donnelly in Clay, he is a charming and well-meaning host, keeping the games going and leading the action generally. His Mr. Doran in The Boarding House seems sincere in the earlier part – when the love and sexual attraction seemed real – especially in the scene with Paula crying in his arms as he noticed the blood glowing warmly “behind her warm skin”. However, when confronted with marriage as scandal is threatened by Mrs Mooney if he doesn’t “do right” by her Paula, he feels that “once you’re married, you’re done for” and starts to fear for his pension. Like most of the men in Dubliners, he represents a poor picture of Irish manhood. Madi O’Carroll is Mrs. Mooney, the buxom, bustling landlady of The Boarding House determined that Mr Doran will do right by her Polly. Since she “deals with moral problems as a cleaver deals with meat”, he had better do so. O’Carroll has a kind of Brenda Fricker quality, a face that lights up with pleasure and genial warmth, whether real or pretended, then tightens with manipulative intent and determination. She fills the stage then retreats invisible, into a corner, creates a minor character with a few rapid squints and a grimace or two, plays the fiddle and anchors the entire production. She is surely a talent to watch. Sarah Baxter’s direction is sure-handed throughout. Movement is fluid and purposeful. Little touches such as the multiple uses of a rope for skipping, then as the rail on deck of the boat in Eveline and the deftness with which the scene is reversed, on ship- on quay, are among the many inventive touches. Barbara McCarthy’s costume design and Cathy O’Carroll’s lighting design are perfectly attuned. Not even the (now almost regulation) interruption of a mobile phone at a quiet moment could quite break the illusion that you are in a Joycean bubble. See this production if you can. It will send you back to read the originals. Who knows, with Bloomsday imminent it might even settle you down to pick up Ulysses again. The show continues at 1 pm until June 17th, with an extra performance on Bloomsday, June 16th at 4 pm.